How law firms and lobbyists protect and whitewash petroleum dictatorships. 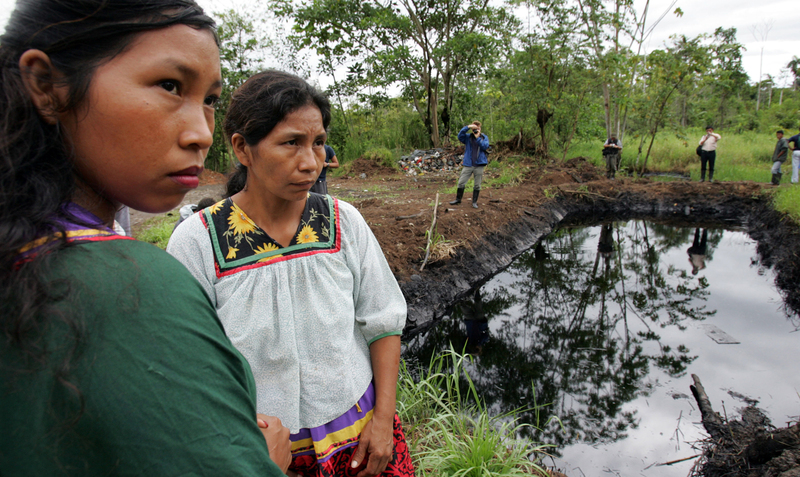 Cofán indigenous women stand near a pool of oil in the Amazonian region of Ecuador in 2005. How much are we in the West responsible for the oil dictatorship in the West African nation of Equatorial Guinea, as well as for other corrupt, vicious regimes in the Global South that are like it? ExxonMobil is the single largest exporter from Equatorial Guinea, and the oil giant pays the family dictatorship of Teodoro Obiang without any qualms. But the usual reaction from the West is simple: such corruption is indigenous to the Third World, and since there is little or nothing we can do about it, our responsibility is sharply limited. Silverstein keeps ExxonMobil’s guilt front and center, reminding us that no one can be bribed without a briber. He points out that Exxon hired a private security firm in Equatorial Guinea headed by President Obiang’s brother, a well-known torturer; and he explains how Exxon “sold” Obiang himself a stake in an oil-trading business for $2,300 that was worth $644,000 a mere six years later. And while Equatorial Guinea may be a sovereign nation, ExxonMobil is an American company—one that should be subject to the Foreign Corrupt Practices Act. If the Justice Department is not enforcing US law, American citizens should know about it. But let’s assume that Exxon is obeying all US laws. Should the company—as well as all those who own its stock or put its gas in their tanks—still be paying oil royalties to the Obiang family? Over the past several decades, the political philosopher Thomas Pogge, currently a professor at Yale, has wrestled with our moral obligations toward the hundreds of millions of people who live in countries like Equatorial Guinea. Pogge has published essays on the subject in World Poverty and Human Rights (2002; a second edition appeared in 2008). Along with an edited collection, Thomas Pogge and His Critics (2010), it is a fresh look at global injustice that deserves far wider exposure. Pogge’s political philosophy is far more developed and persuasively argued than a simple observation that the globe is increasingly connected. His analysis of global oil is just one example of his originality. He starts by observing that the international legal order is partly grounded in what he calls “the resource privilege,” which is based on the assumption that a group of people (however small) that takes control of a country by any means (however violent) has the legal right to dispose of its oil and minerals in international commerce without any questions being asked. Pogge points out that if a band of thieves seizes a warehouse and sells off the items inside, the people who buy that property are called “fences” or “receivers of stolen goods”; while if a band of thieves seizes an entire nation, the people who buy its stolen resources are called ExxonMobil, Chevron, BP et al.—and their rights are guaranteed by a system of international law enforced by the rich and powerful countries. The reality, however, is far worse than mere theft. The people of Equatorial Guinea would have been better off if Exxon and Chevron had simply invaded their nation and stolen their oil outright instead of paying a dictator for it. Either way, they would lose the royalties—but by giving money to Teodoro Obiang, Exxon helps to strengthen his family’s grip on power and reduces the chance that the country’s $14 billion in oil revenues every year will ever provide running water or decent schools to more than a fraction of its citizens. There is another complication. In recent decades, scholars have identified a “resource curse”: windfall discoveries of oil and minerals, which at first seem like good news for poor nations, can actually end up harming them. For instance, countries in the Global South that export oil and minerals are more likely to suffer under dictatorships than their resourceless counterparts. Pogge points out that the “resource privilege” partly explains this paradox; the bands of robbers have strong incentives to seize national governments because they recognize that once they’re in power, oil companies will pay them billions, protected by international law. Pogge says that if we in the West look squarely at this truth, we will see our responsibility more clearly. I may well have humanitarian concern for Marcial Abaga Barril and the other Equatorial Guinean people I met a few years ago. But I also owe them, because I am a citizen of the powerful nation that is enforcing this international system of rules—a system that hurts them in ways that are foreseeable and can be changed. I may not have bad intentions, but in today’s interconnected world, I am nevertheless doing my share to harm other people. Pogge’s view isn’t socialist or even particularly radical. He himself favors the positive duties of humanitarianism and global egalitarianism, but he sets those aside, arguing instead that even libertarians and conservatives should support what he calls the negative duty not to harm others. He also offers a number of suggestions to reduce this harm. Pogge floats the notion of “Democracy Panels”—impartial, independent boards that would monitor resource-exporting countries and quarantine those like Equatorial Guinea as long as the Obiang family remains in power. He recognizes that such remedies are difficult in theory and even harder in practice, but we can at least start by recognizing that we are each partly responsible for the huge injustices that are occurring. The Secret World of Oil bolsters Pogge’s expanded view of global injustice. Especially valuable is its chapter on oil pollution in Louisiana. Silverstein uncovered the inside story here by using his considerable reporting skills to take advantage of a stroke of luck: a high-ranking oil lobbyist mistook him for another journalist named Ken Silverstein (this one the editor of an “industry-friendly” trade journal) and ended up boasting to him about writing laws that should have been the responsibility of state legislators. Big Oil has operated in Louisiana since 1901, leaving behind thousands of sites polluted with oil and cancer-causing chemicals. Quite a few landowners, including prominent citizens, have sued to force Chevron, Exxon, Shell and BP to clean up the dangerous mess. Silverstein reports that the battle is a standoff; in most places, Big Oil crushes its opposition, but here the two sides and their high-priced lawyers are more evenly matched. The state’s right-wing governor, Bobby Jindal, has been keeping mum because he has moneyed supporters in both camps. As a result, the Ecuadorean villagers will once again have to postpone construction of a cancer hospital intended to treat the high number of people afflicted with the disease in their area. In the meantime, Chevron—which earned $21.4 billion last year and no longer has assets in the country—can afford to wait. Justice delayed is justice denied. The people who are suing Chevron in Louisiana are at least assured a fair trial at reasonable speed with enforceable verdicts. Ecuador is different: even if the villagers do win some compensation in the end, other victims may understandably hesitate to enter a legal process that could be interminable. Injustice is global, but there is no effective system of global justice to counter it. Once again, the system of international law works in ways that actively harm poor people throughout the world. The Secret World of Oil has one weakness: Silverstein should have reported more about the growing worldwide campaign to “Publish What You Pay,” which aims to reduce secrecy in oil and mineral transactions. Section 1504 of the 2010 Dodd-Frank Act requires the 1,100 oil, gas and mineral companies listed in the United States to publish how much they give foreign leaders and governments for the right to drill or mine. (Until now, such payments could be kept secret.) The SEC published specific regulations in August 2012, but Big Oil won a reprieve by successfully challenging the rules in court. Now, the SEC will not issue revised regulations until March 2015—an unconscionable delay. What the world really needs to establish global justice is an International Economic Crimes Tribunal, with the power to extradite, try and even imprison those who steal billions. In the meantime, “Publish What You Pay” can only help.